The cattle we raise are a mix of Hereford, Angus and Red Poll (heritage breed) crosses. Our cattle are raised from birth totally grass fed along with our breeding stock animals who are 100% grass fed as well. Animals are rotated continuously to fresh pastures until around 20-25 months of age when they are ready for market. We also have older animals that we process on occasion that make excellent burger and other flavorful cuts meat. 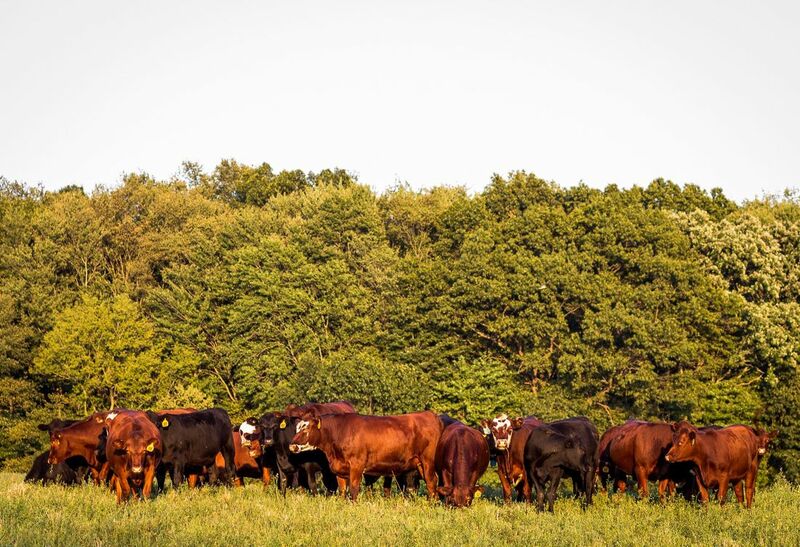 All of our cattle are free of added hormones and antibiotics. ​We also use all natural worming methods. Our cattle are completely grass fed. During the time they are grazing out on pasture they have a multitude of forage choices. Including alfalfa, grasses, sorghum sudangrass, forage turnips/radishes, clover, just to name a few. They also have access to free choice mineral. They are rotationally grazed frequently to fresh forages in order to keep the pastures, soil, animals and environment in a healthy state. 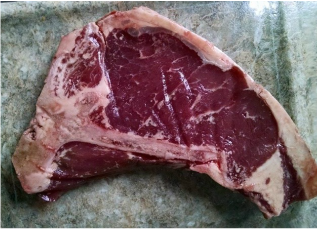 Our finished market animals are processed at an USDA inspected facility, Countryside Quality Meats located in Union City, MI. They are a small facility that handle the animals very well throughout the entire process. Customers call in their own orders, but we are happy to help determine what cuts you may want. Each cut is vacuum sealed with a label on the package containing the cut name & weight, your name and our farm, Rocky Oak Farms. We also offer individual cuts for sale either directly from us or at a few local stores.